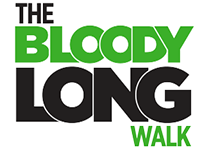 Only three more sleeps until The Bloody Long Walk. I will be so happy when it’s over as I feel like I’ve been training for it forever. I started training for Melbourne Coastrek in December 2016. When that was over in May this year, I just continued on with the training until now. Today I was thinking about how many kilometres I’ve covered in training during 2017. I have no idea but I do know it’s LOTS. Just for fun I thought I’d add up the kilometres walked in the past 2 months. I use the Map My Walk app and my Garmin GPS to measure my walks so doing the calculation is easy. So, that’s 46 walks for a total of 475 kilometers in just over 97 hours. No wonder my shoes are wearing out! I’ve been a bit concerned that I haven’t trained enough. I always get those concerns as an event looms closer. But when I see those stats, I realise that I couldn’t have done any more than I’ve done, so just have to cross my fingers and hope that all goes well on the day.